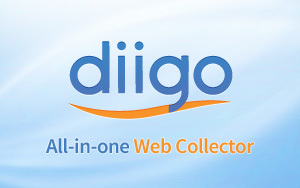 Those of you who use Diigo have seen the new interface; I'm not here to praise the interface (I haven't even had time to try it out yet really)... but instead I want to sing the praises of the customer support staff at Diigo who were SO HELPFUL in the past two days since the interface went live for all users: all my legacy links were broken, and I was desperate — I rely on Diigo a lot for my own bookmarks but, more importantly, I use Diigo as a tool for my classes; it's how my students browse the Freebookapalooza Book Library Online, along with other class resources. So, when the new interface went live for all on Wednesday, I was in big trouble: was I doing to have to recode by hand all my hundreds of legacy links? I immediately used the feedback button in the lower right-hand corner of the new interface, reporting the problem. I really didn't expect anything to happen; I was mostly just venting because I figured I would have to spend the whole weekend redoing my links with the new syntax. But... I got an email response from someone named Lynn at Diigo who assured me "The developer's looking into it and will fix it soon." Now, I was not really confident about that, but I emailed back some more examples and screenshots. Then, over Wednesday night, they made some fixes, and then on Thursday they made some more fixes, and I kept sending back screenshots for instances that were still not working... and by Friday morning, I got an email from Diigo asking me if everything was now working — and it seems like, indeed, all my legacy links are working! I'll keep exploring this weekend, when I will also have time to learn more about the new interface, but I wanted to post this just as a big THANK YOU to the Diigo developers for their excellent response to the problems I was having. Supporting the legacy links is something I think is really important, and I am so glad that they've got that working! I'm now looking forward to learning more about the new interface without having to be in a panic about all those existing links. 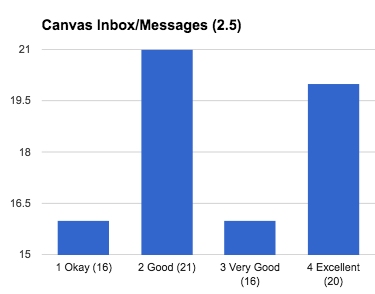 Earlier today I posted the numbers from the Canvas Survey I did in class; below are the numbers from the Class Survey. Total number of students: 78. Number of responses: 76. You can see the survey here: Class Survey. 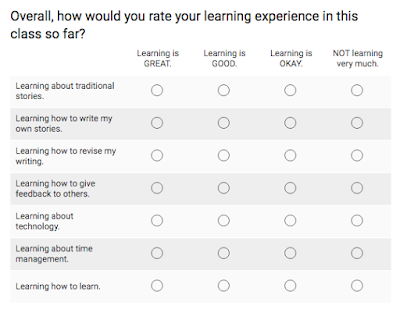 The information in this survey is really just relevant to my classes (and I have got some good ideas for improvements already! 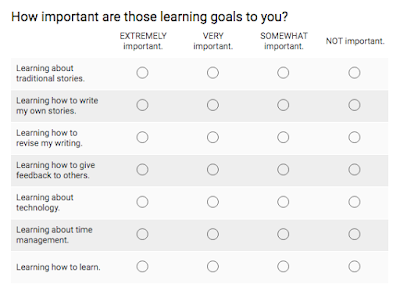 ), but I wanted to share the one numerical question that I asked because I used a format option at Google Forms that I thought was really helpful: I asked students to rate their learning in the seven different dimensions of the class, and then I asked them to rate the importance of those dimensions. That allowed me to then identify a rating that reflects the gap between their learning (from 1 low to 4 high) and the importance they place on it (from 1 low to 4 high). The "rating" is a calculation based on the difference between the learning and the interest. If a student rated their interest as 4 but their learning as 3, that would be -1. If their interest was 1 but their learning is 4 that would be +3. If their learning was just 2 but their interest was also just 2, then that would be 0. I did that calculation for all students and then summed the result to get the "rating" for each area. It's basically a way to try to quantify whether I exceeded expectations (positive rating) or failed to meet expectations (negative rating). 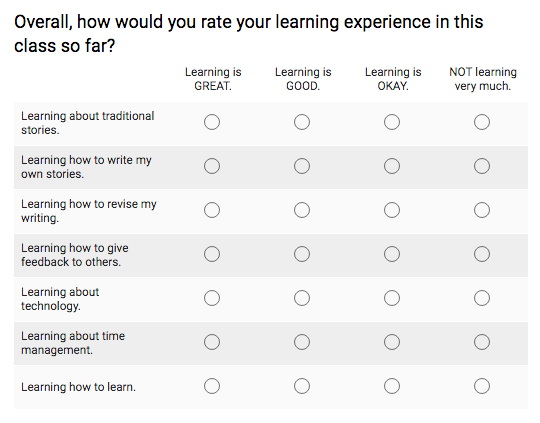 I need to remind myself also that numbers are always misleading, so while I am number-crunching here, the range of average ratings on learning is from between 3.0 and 3.4 on a scale of 1 to 4, which is to say, the learning is all basically good, and basically the same good really. So too with the range of interest, from 2.8 to 3.5, basically all good too. The numbers are not worrisome; they are just a way (admittedly artificial) to try to help me make the decisions I do have to make about prioritizing the time I spend on course development. Reading. I was really surprised that people's expectations were so low for the reading. Yet the reading got the highest ranking for learning! As a result, the rating is highest for reading: I exceeded people's expectations mostly because their expectations were so low. The optimistic thing to say is that I have worked really hard on the readings over the past three years, and my efforts have paid off. On the other hand, if students don't really put much importance on the readings for class, I probably do not need to focus too much on making more improvements to the readings; I need to work on other areas instead. Technology. This was probably my biggest surprise of all. Students' interest in learning about technology was the lowest of all the seven domains! Honestly, I thought it would be the highest. I think this probably reflects the extremely low importance placed on digital literacy at my school. That worries me. In addition, the students report the lowest learning when it comes to technology, but if they say it is their lowest priority, I'm not really sure what to do. I think that means I need to try to make much more explicit why I place such a high importance on learning about technology. The thing is, I feel like I do that already, so I am kind of stumped. I really need to think about this one some more! Revising. I was also very surprised that students expressed so much interest in learning how to revise their writing; it was the highest rated area! That means I also fell somewhat short in meeting their expectations, but not by too much. This is an area of the class I have worked hard on over the past two years by implementing growth mindset. With that overall growth framework in place, I think I now need to do some more direction instruction too. If students really are struggling with writing mechanics, for example, I probably need to do more explicit teaching about that, and also more explicit teaching about writing style and writing process. That will be a real pleasure for me, and I think I will make that my focus for next summer. Time Management and Learning to Learn. These areas rate on the high side in student interest and the low side in terms of learning, which means I have work to do here. Right now, I address these areas in the Learn by H.E.A.R.T. and Growth Mindset challenges, but those are extra credit options, and most students do not do them. So, I probably need to rethink that. If the students place a high importance on these domains (and they do), perhaps the time has come for me to find a way to integrate that more directly into the class, instead of having it be something that is extra credit. One possibility might be to let students swap out one reading assignment each week for these meta-learning options. But that will require working really hard on building something more like a time curriculum and a learning curriculum (the challenges I have right now are pretty low key and unstructured). Can I manage to do that next summer also? Perhaps. Although that might end up being the project for Summer 2018 instead. Anyway, I learned SO MUCH from these numbers, in addition to the very helpful comments to the free response questions (as you can see from the survey, the open-ended questions are VERY open-ended: Class Survey). 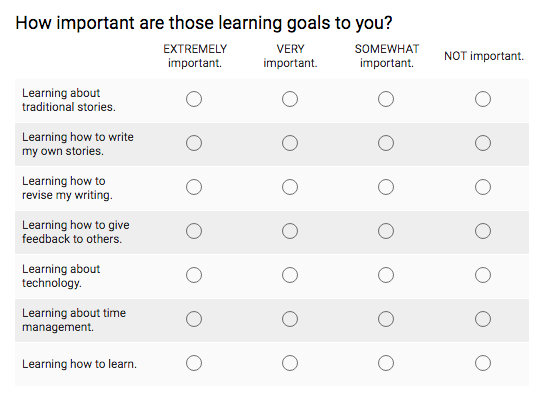 I'm usually not a fan of numbers, but by asking about the importance the students put on the different areas, it gave me a really useful way to interpret what they reported in their learning for those areas. 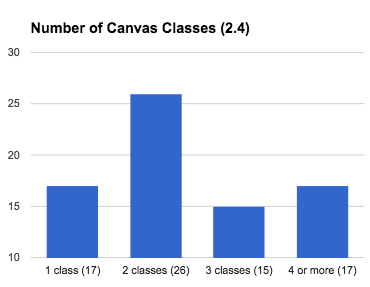 Here are the results of my Canvas survey available during Week 8 of the Fall 2016 semester. You can see the survey here: Canvas Survey. These are from my students in two different classes, both fully online classes. Total number of students: 78. Number of responses: 75. My use of Canvas is very minimal; they are both open (no log-in required), so you can see: Myth.MythFolklore.net and India.MythFolklore.net. I didn't offer any special instructions in how to use Canvas, although I can see I should write up notes about how to configure the notifications. Below I have summarized the ratings in chart form, and I have listed the free responses below; see especially the advice to instructors and to students — that is very useful I think! In a separate post later this week, I'll write up my thoughts about this; I just wanted to get the raw data out for now. What are your favorite things about Canvas based on how it is being used in this class? I really don't like it and wouldn't want to use it in the future. I like the calendar application because it gives me a clear view of everything that is due and when. I like that you can email directly from canvas. This has really come in handy. I also think the calendar is cool...it doesn't do much good for me now because I am only using one Canvas class, but I'm sure it is super helpful when you're balancing a bunch of classes all in one place. I enjoy entering my own grades. I like how easy it is to view my grades. I like the grade book feature and the simplicity of everything. I really like that it's easy to access on my phone. I think the daily announcements are very helpful, and they are good for reminding me about upcoming due dates. I also like the grades section because it lets me see the percentage of assignments I complete for each week. I love that I can use it in a faster manner than d2l but I would have to see it being utilized as a supplement instead of an entire class to get the full experience. I like being able to see my grades very clearly. Much easier to find what you are looking for. Easy to navigate. I like the new calander. I like that all information can be found on Canvas! I absolutely love the assignment calendar D2L's never showed up! I really enjoy the calendar and that I can click on an assignment from the gradebook. Truly only the grades are being used in canvas. It's pretty simple tho. I like how there is a turn-in time frame, and I like the design. I like the simple interface of Canvas. I also like how the course announcements are displayed on the front page for the course. The modules are easy to use. I love having the checklist for what homework is due that week. I also like having the gradebook because it has your current average for the class based on percentages so you don't have to continuously keep going into an excel spreadsheet and calculating your grade that way. All of your resources are found in one area (inbox, files, grades, etc.). I can see my grade throughout the entire class on my own without having to contact my professor. At the bottom, AND as a sidebar, are the upcoming assignments that are due. I just have to click on them and get to take the quiz/submit them. I love the grade book and calendar. It is extremely useful and easy to navigate. I think it is much easier to navigate and use. Especially with this class, I am able to see my announcements and what I need to do easily on the first page. My favorite thing is the calendar! I was able to upload it to my google calendar to help me keep track of assignments. I like that they are able to send you announcements that you can easily see and they give you an alert for them. I also extremely love how the grade book is and that it gives you an exact percentage of what your grade is. The automatic grade totals in the grades section. I like that all of the grades a re right there and you only exactly how you are doing in the class. I really like the calendar. It gives me an overall look at what assignments are coming up and when they are due. I like that I can see all of my grade as well as project my class average based on future grades. I also love how all of the assignments are in the calendar. It feels more organized when it comes to shared files. I like that you can have the Canvas announcements sent to your email. I also like how the layout of the different tabs; they are easy to navigate and have made it an easier transition. I also like that the grades tab shows when new grades have been posted. I know D2L had something similar, but it wasn't as defined or prominent. On Canvas it is a lot easier to tell when a grade has been posted and you don't have to constantly check it. The layout is just super nice and easy to navigate. The Mobile app is very nice, as well how everything is organized. It makes life a lot smoother. everything has a place. Not like D2L everything had like four or five different folders you had to go through. I think canvas is a lot better for online classes. Especially with the way that you use modules to mark what we have done. The app is 1000 times better than D2Ls and it is a lot more interactive. I love that the modules are easy to find and don't take long to access, and that there's a "grace period" feature for turning in assignments, which this class uses. I like that it lists what quizzes I still need to take off to the right hand side. The ability to leave a comment when you submit something for grading. The page dedicated to the Syllabus, which makes for quicker access, since you don't have to open a file through a system viewer. 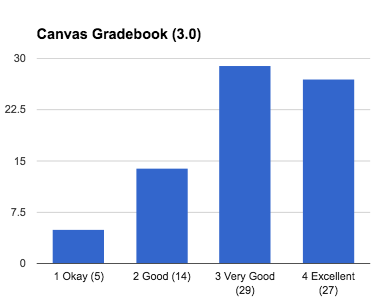 Since we only use canvas to complete the modules, I like how the grade book is. I really enjoy how easy the grades are to navigate! Canvas is very easy to navigate for taking an online course. Previous online courses were sometimes difficult to find assignments and what to do. 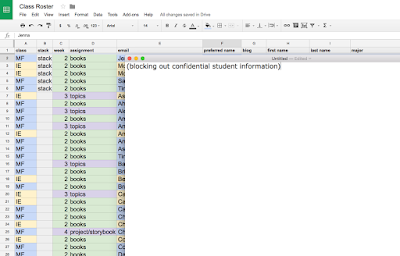 The gradebook and how I can keep track of my grade easily. It is so convenient to access grades and quizzes because of the To-do feature on the side bar. I like how quiz grades automatically update so that I can see how I am doing in the course. The calendar organizing the due dates of the assignments. I like how this class has it set up! If you are using Canvas in another class: what other feature(s) of Canvas are you using different from this class (discussions, chat, etc. ), and what do you think of those features? I'm a TA for a class that uses the message feature of Canvas quite often, and I think it's a helpful way to communicate. This is my only class using canvas; but as a student employee I do have TA access to some other courses and I believe it is all about how the professor utilizes canvas. It can become very, very confusing for the student if the professor does not know how to organize their canvas page. Canvas gives a lot of freedom to the professor and how s/he sets it up for their students. In my other course we have to click Next, Next and Next to get to each section. It is way to time consuming and makes what few hour assignment into three. We aren't using any features other than posting documents on the modules page. I really don't use Canvas for my Spanish class much. Only to view grades and the class calendar which is just on a file in Canvas. So we don't really use the class calendar. I have used discussions and it works well. I'm using it for human anatomy and I like how organized canvas keeps all the files. For my other class, the only thing that I have to do differently is upload files to Canvas, which is a pretty easy process. I really like the document preview feature. My other class is Modern Physics, and our professor uses it to post the lecture slides and announcements. The announcements are nice because they get sent to my e-mail so it's easy to stay in the loop as far as office hour changes. I like that I can organize the layout of my gradebook and contact people via the inbox rather than going to a separate page. My professor only emails us through it and posts handouts. It isn't used near to the extent as this class. All of the assignments are on canvas as opposed to another website. I'm using discussions in my LIS class. They're good. It would be nice if replies were a little more indented though. In and IAS class we are using the discussion feature a lot more, and it is difficult to navigate. All the students post, and then we reply to any student's post that we want. The page gets incredibly long and difficult to navigate, or go back up or down to reference where I've commented on another student above or below where I am currently trying to navigate. It's overwhelming. The only thing that is different is that we turn out papers in through canvas. It is easy to manover around in Canvas. The grade book is awesome. And I like you it shows you what you have due on the side of the page. The other class that I'm in that uses Canvas is strictly for discussion posts and grades for those discussion posts. we're using dropbox in my other classes, and it's pretty simple. We are using the discussion section and I like it. All of the same features are being used in my class at the moment. The three classes of mine that are utilizing Canvas are all using the features pretty similarly. Uh, I have used the assignment submissions and the pages/files sections. It's a little difficult to find certain things since you never know which heading it will be under. Online homework submissions (which are easy and good) and group work. The group work seems like it's a good system, but we haven't used it heavily yet. I like that you can upload from Google Drive. Uploading files in Canvas is generally easier, I ran into a ton of problems uploading to D2L in the past. All of the lecture power points are posted in a section separate for different assignments. The only other feature of canvas that another teacher is using is the pages which links to our blog site for the class. Although it is nice to have it there, it doesn't open to the actual site so I can't post from canvas. My other classes are classroom-based and don't use Canvas as much, but again, it's easy to find uploaded docs and slides in the Modules area, which is nice. We use the modules and file folders for reading materials. I really like that, in my other courses, I'm able to view "all files" that have been uploaded to the course page. That comes in handy often. There are a lot less external links, but I think that is because none of my other classes are online. In general, I like the integrated file viewers and the mobile app. Features like the Calendar and Collaborations sections seem useful, but most of my instructors have yet to take advantage of them. All of my homework for my other classes is on canvas so we have quizzes, drop box, discussion. Coming back to the gradebook, it allows for easier grade calculation because students can put their expected grade in to see how low or high it can be to achieve the grade they want. My other classes mostly use the quiz and discussion board features and I haven't really noticed anything special about them; they're fine. I do not have any classes using the discussions. This class uses Canvas the most. I have discussions in my other class. It seems somewhat easier than d2l. I use the discussions and messages more in my other classes. I really like the messaging system because it's so convenient to email the professor. I do not like how that chat and notification icons do not go away after they are read. Discussions seem to be same as d2l so I'm indifferent about its other features. My other classes aren't using any additional features. Have you had any problems using Canvas? Please describe. How did you solve the problem? It is so hard to maneuver through Canvas. It's not as integrated as D2L. I haven't had any major issues so far. At first the layout was confusing, but after a while I got used to it. No. Sometimes it is slow. Yes, discussions froze for quite a while and I had to forfeit making comments for that week. Also, it messed up due dates for my other course to were for the first 2 months of class I didn't know when anything was due. When you comment in the gradebook it doesn't notify your professor although it states that they will be notified. I only had trouble figuring it out at first. It was hard at first to get the hang of it! Once you learn it is easy, but at the beginning it can be kind of hard. Yeah, I did not know that you could send notifications on Canvas and missed 2 quizzes because of it. Had it been like d2l, I would have known because of the way that it is set up as well. D2L shows all of the deadlines on the main page, canvas does not. Yes! It was difficult to navigate at first, but I got used to it as time went on. I can never find the files i'm looking for! I just hit enough tabs until I find it, but then i have to repeat that process the next time around. The only problems I've had are from the teacher's side. They might need an extra lesson or two and it wasn't in this class. I get easily confused where the instructor has posted readings or documents we need to print for class on Canvas. No problems that I can think of... sometimes it runs a little slow, but that's it. I still have NO clue how to submit a paper. Where on earth is the Canvas analogue to D2L's dropbox? None of my instructors seem to know either. Additionally, I can't get TA access to the courses I'm assigned to as tutor, which was never a problem on D2L. Could be a user error, but IT should probably send out a "how-to" to instructors before next semester, because not having full access to the course materials can really make it harder on tutors and TAs. I have not had any problems using Canvas, it just took me a little while to adapt to the new locations of everything. Sometimes things get a little lost and I can't find them. Like a certain announcement or assignment. It was confusing at first, but I have gotten the hang of it! Not all teachers use the same layout when uploading items so finding items is difficult sometimes. Are there things you do NOT like about Canvas? 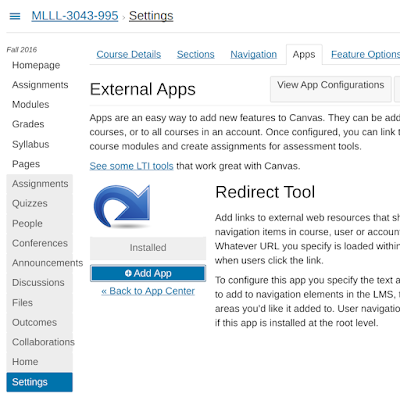 Is there something you miss in Canvas that was possible in D2L? I do not like the assignments tab. It not as clear as D2L in what is due and when. I don't like anything about Canvas. 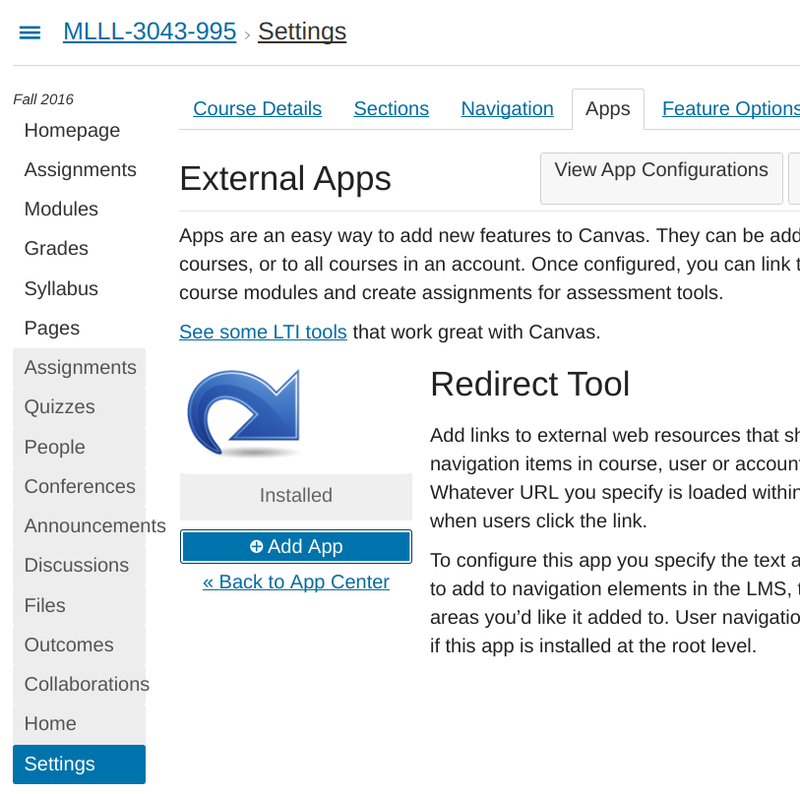 It's not as integrated as D2L, and it's hard to find everything in Canvas. Canvas is new and therefore I don't particularly like it. I was used to D2L and when I have one class using D2L, one class using Canvas, and another class using another site, it all gets very confusing and frustrating. If I could spend more time with canvas and had more classes with it, I think I would like it more. I like the layout of D2L's grade book better. It is much easier to see all of the grades and I like that they are separated by topic on D2L. I was very used to using D2L, so I think I just need to get adjusted and I will like them about the same. I miss the easy way that D2L was set up, discussion and notifications were instant and nothing was overly complex. Canvas seems to make things more difficult for no reason. just because there is a syllabus tab does not mean the professor put the syllabus there. Canvas will only be better than D2L if the professors take advantage of it. I feel like Canvas is a little less organized aesthetically than D2L is. On D2L, I always knew where everything was, and on Canvas it gets kind of jumbled. The navigation could be better. Also, it appears differently depending on how the course is set up by the professor. D2L send reminders when things are due. So far, I haven't be able to figure out how to do that on Canvas. Don't like that grades show up and you can't hide them from your homescreen. D2L has really organized categories for professors to put homework solutions, test solutions, notes, etc. whereas on canvas it's difficult to find everything sometimes. Nothing I can think of! I don't like how half of my classes are on D2L and the others are on Canvas it makes it hard and time consuming to check grades and assignments. I would like there to be a button so that once you have scrolled all the way down in a tab that will bring you back to the top. So that if I want to save time by going to announcements to Models or something I don't have to scroll all the way of or leave the particular tab just to go right back into it again. I don't like how there isn't a general "content" tab for Canvas like there was for D2L. There are so much folders and files within the modules of Canvas and it isn't as simple to navigate as D2L for me. I had all my settings perfect, where when the teacher updated a grade I would get a text message and such. To be honest I havent looked to see if canvas has this option but I miss it. The quizzes need to show how many attempts have been made on them on the quiz list. D2L was really easy and straightforward to use. Canvas has a lot of features that are always available but not always necessary to the class. I wish there was a dropbox section. Also that you can upload multiple papers. and the most recent one can cover up the first one you uploaded. I'm not sure if the Files section works the way the old personal Dropbox did back with D2L, so I haven't used it much. That's the only thing I genuinely liked about D2L. 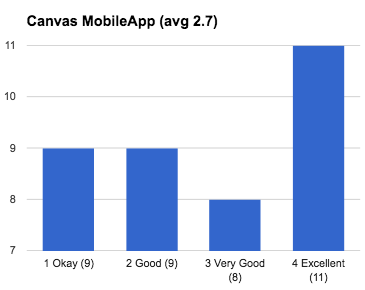 I don't have any complaints about Canvas. I don't like the confusing structure of where documents are uploaded onto the site. The two platforms are very different so it is hard to compare. In my opinion, D2L was simpler to navigate and more user friendly from the student perspective. I also would like to receive confirmation emails whenever I submit an assignment or finish a quiz. I don't like that it constantly shows my calculated grade in a class. Due to a constant upload and continual adding of points my grade can vary greatly. I think it's fine to have the calculated option, but please don't have it glaring at me 24/7. See above. I don't know if anything is missing, but I don't know where to find some things! D2l was a little easier to navigate. I do not like how the emails link in with canvas. I found this to be a confusing addition and just another thing to check. I don't like that you can't batch download all the files from a course. In D2L it was possible to set up text alerts when my grades were updated. I REALLY miss this feature! What advice would you give to INSTRUCTORS who are setting up a Canvas course? I don't really know, since this is my first and only class with it. I am someone who hates change and is bad with technology so I was super stressed at the beginning of the semester when I was trying to figure it out. I would suggest having the instructor give a detailed explanation of how to find things and submit things since most students are very used to how D2L works. Having all the assignments available to work ahead is a nice luxury. Learn from Laura Gibbs! She has this Canvas thing down. I would just make sure you know how to use Canvas so that you can better help your students understand. Go all out and use the inbox systems. 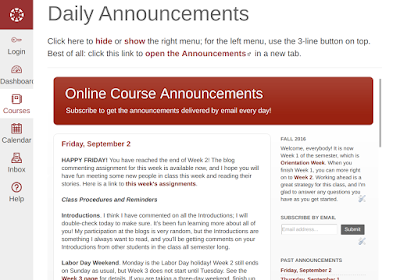 Keep the course as organized as possible, and try to send daily announcements if you can. Also keep the grades updated. Everything Dr. Gibbs has done thus far I have enjoyed and preferred over d2l. Make it as easy on the students as possible. The transition for most upper classmen has not been easy. Tell the students the cool new features they might not be aware of. The students have not had the training the professors should of had. Updates can get lost easily, I like when teachers send messages to your inbox. Put assignments on the calendar as soon as possible. There are a lot of opportunities on Canvas and they should fully take advantage of them. Be mindful, it's the glitch-iest thing in the world. Make it as simple as you can. Use every aspect of Canvas in order to really help out students. Try to simplify things as much as possible. Having a lot of different moving parts in your class on Canvas can get wildly confusing and sometimes students can't find certain things. Use the modules page for documents so that students can see a preview before downloading. I haven't had any issues understanding Canvas so nothing really. Seems pretty simple. Use the grade book feature, it really helps see where we are at in the course. Just update it regularly when there's new material. To make sure you know what you're doing before you open it up to your class because if you don't know and I don't know, its going to be a rough semester. Keep it simple, but don't be afraid to make it your own as well. It seems like there's a lot of freedom within Canvas setup for teachers to customize their online environment for students. Posting things to "Modules" and "files" gets confusing so I would only choose one to use. Make sure there feedback responses (grades, announcements, files) are categorized and organized efficiently; don't split up stuff and make it hard for students to find. Help the students learn it. Laura was really great at helping us learn. Make the calendar as filled out as possible. Please adjust the settings of the modules to load the current week at the top. My instructor did this a few weeks into the semester for this course (MLLL-4993) and it has made a great deal of difference in getting to the modules I need quickly and efficiently. We're covering a lot of material, and I like that the material we are finished with is at the bottom of the page. Make it as organized as possible! My other class is not completely organized so some readings are in random spots under the files tab. Show your class what areas of canvas they need to be familiar with and show them how to use it. Post on the announcements often. Keep in mind that students are still learning and getting used to this new platform so try to make your content and assignments as easily accessible as possible. make sure you have the files that you need published so that the class can actually access them. Include a tutorial for how you yourself set up the class, as I feel that it can be varied. Please have clear instructions in the assignment tab if you won't be making an announcement about the assignment. I think the main issue I've noticed in my classes is making sure content is being published for students to see. I don't know how it looks on the instructor's end, but I just got the impression that some seemed to think they had published something but they really hadn't. So maybe just making sure that when you publish something, check to see that it is marked published. Or you could make an announcement that something was published and if it cannot be seen to notify you. Knowledge of where the assignments or pages that we need are. To make sure everything is nicely organized. Cause canvas already has that set up for you. Utilize the calendar, make sure everything opens once you upload it, delete the sections you are not using so that we know where to find things and so we don't have to click through 20 options to find the syllabus. My instructor for this class is much more familiar with various tips and tricks for Canvas than my other instructors are, and it shows. If all instructors would take the time to get to know all the features and how to apply them to their classes, I think it would be a more efficient experience for everyone. I'd suggest specifying in the syllabus WHERE on canvas you will post certain documents (i.e., readings, things to print, assignments etc). Try not to use too many folders - sometimes I can't find a file because it's filed away in multiple folders or in a different tab, etc. Also, I don't like when instructors send messages through canvass; I prefer an email or an announcement. Use the modules as a week by week guide for what's going on in the class. Files can be separated by lecture, exam study guide, etc. Make use of the calendar and syllabus sections. Make sure your TAs have access and your students know how to submit files. Please utilize the module tool for grouping content. It makes the canvas page so much easier to navigate. I would say to use the calendar as much as possible so students know what is coming and what to expect. Please have instructions for each individual assignment on the assignment's page itself so that it's easier to find and I don't have to search for them elsewhere. Try to make things simple. It would be nice if all the tabs led to the same type material. Don't set up to many side tabs to separate out the class. Try to make tabs to separate things such as assignments, powerpoint, syllabus, action center etc. What advice would you give to STUDENTS who are using Canvas? It's hard to learn how to use it. Just be patient and take time to go through and look at and learn everything. Don't stress too much because it really is not that bad. Take a day to just click on everything and see what all the links do/how to find your assignments. Don't wait until you need to submit something because that will make it a lot more stressful. Make sure to keep up with your assignments using the calendar. Give it time, it will grow on you. Take some time to navigate it and learn all the features. Look at it and play around with the tools. Make sure that you keep up with the assignments and check the calendar frequently. Explore and mess around with it for a couple of days to get familiar with it all before classes start and you arrive confused. Just have to play with it to understand it better.... but who has time to learn an entirely new system??? Check grades frequently and always check deadlines. Make sure you check the calendar everyday for your assignments and due dates. It's easy to navigate, there's multiple ways to get to the different sections. Prepare yourself, it's going to take a while to complete an assignment. Mess around with it for a while before you have to start using it in class. It's a really great tool, but can take a while to get used to. Contact professors directly through your email instead of the inbox on Canvas. Just look around and get familiar with it and it's truly not complicated. Download the app and turn notifications on. It'll tell you if your teacher has sent any messages. Learn to use it or get left behind. Check your notification settings to set your preferences. You can get notified about almost anything on Canvas. Also, the grade estimation feature is pretty cool. Take advantage of the To Do list that pop up if you want to remember to turn in homework. Keep playing with it . Don't be afraid of changes! Turn on the alerts for canvas and reminders. Take advantage of the calendar. Don't use it on your phone or tablet. Make sure to check it frequently or set up the notifications options so that you would know. Be willing to look and explore. Be sure to constantly be checking your announcements! They are usually full of reminders and assignment information that can be helpful. You should still check it frequently as you did in D2L. It may seem like a lot of new information to learn how to navigate, but it really is quite simple so don't let it intimidate you. Make use of all of the features. Make sure you check the announcement section. Also don't mute OU Canvas emails. This is where all the teachers announcements come from. It is pretty user friendly... just ask if you have a problem. I didn't pay attention to the calendar feature until late in the game, so I missed out on how handy it is for quite a while. It's a good idea to take a little bit of time at the beginning of the year, before homework gets crazy, just to get familiar with all Canvas has to offer. Really communicate with your instructor and your classmates about how to navigate the class on Canvas. Explore a lot because professors don't know how to use it yet and are still figuring it out and may have files/documents in odd places. I mean, just do your thing. You're digital natives, right? set up the mobile alerts. You can connect the canvas calendar to google calendar or the iphone/android calendar by importing the .ics file. It's super easy and you won't forget about deadlines that way. UI is really easy to navigate. It's basically D2L with a different look. Give it time. Sit down and find out where everything is at the beginning of the course so that you don't miss something important. What is your overall impression of Canvas? It's a piece of junk. I'd prefer to stick with D2L or have all of my classes go to canvas at the same time. Not all of this some classes on one site some classes on another crap. It's aggravating and unnecessarily stressful. I like canvas and am getting more used to it. I am thankful this is the class that I started out Canvas with because Laura is so helpful and detailed in her descriptions of where things are located. I wish we still used D2L just because I am more used to it, but I am sure next semester will go smoothly as well. I like it so far, haven't had any problems with it. I like it. I think it's a good, useful platform. I think it's a step up from D2L. I feel like it's more organized and nicer to look at. 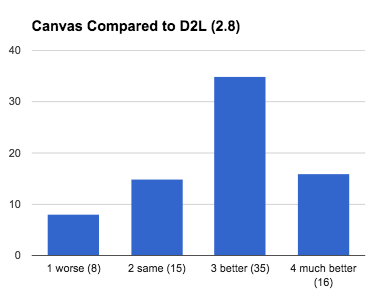 I like Canvas far more than D2L. It feels more current. I feel like I can communicate with teachers easier. I like it better than D2L! It seems to have more things for profs to use! 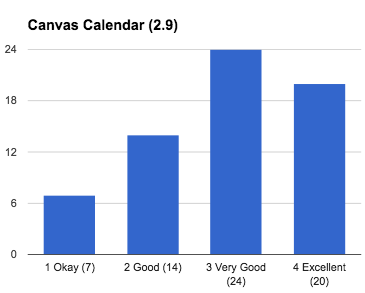 I'm partial to certain things in Canvas (Calendar and the grading) the rest is horrifying. I definitely understand the need for a change from D2L, but I feel like this is a lateral move rather than a great improvement. Maybe once the professors learn how to use it, it could be better than D2L, but currently there is not much difference. It works well. I don't think I've really experienced all the features yet though. I like Canvas. It looks better and more modern than D2L. I like it a lot. Just would like the reminders of due dates. It's a pretty good online education portal. One of the better one's I've used. It looks nice but everyone who isn't a freshman is so used to D2L that it's annoying having to go to two different websites for classes since some professors don't use canvas. It is simple and clean, which I like. However, why the panda in the loading bar? Is a panda the mascot for Canvas? Amazing! I love Canvas and wish all of my teachers switched over this year! I enjoy it! I will like it even more once we fully transition to canvas! I like it, but I feel like D2L was a little more simplified. But that very well could just be my impression and other students might feel differently. I'm not sure if it's the way my professors have uploaded their content or if that's just the way Canvas presents that content. I wish we would have stayed with D2L because I knew everything i needed to know about D2L. I don't like having to learn a completely new software with no outstanding points that make it noticeably better than the previous software. It takes some getting used to but its alright. It is neither worse nor better than D2L. I think it is better and way more organized than D2L. It feels more organized, but I can't say it's far superior than D2L. Overall I think Canvas works well. I don't have any complaints. It's well laid out and effective. I like it. Enjoy it, frustrated that half of my classes are on canvas and the other half is on D2L though. Everyone needs to make the switch or no one should. I was worry about it at first, cause change scares everyone but I love canvas. I keeps me way more organized then D2L ever did. I also feel like I know where everything is. And the courses are separated from each other. Rather then in D2L they felt like they were on top of each other. Great program. Just wish it was all of my classes and not half of them here and half of them on D2L... Maybe it was easy for the teachers to decide but it is very disorganized for students. I genuinely love it. It's so visually clean and easy to navigate compared to D2L, packed with useful tools, and everything is easy to find. I wish all my classes this semester had switched to it. Way too many details and fairly confusing to navigate. It's a fine replacement for D2L, I haven't had any problems with it so far, and it was very easy to figure out how to use. There is a lot that you can do with Canvas which is a good feature. I also like that I, as a student, can create a course. I created a course for my Thesis research and invited my mentor and advisors. They can see my progress, add files, offer suggestions, etc. It is very convenient. It's good, but I was so used to D2L I'm not sure it's that much better. It's nice. It would be nicer if profs made better use of it. it is okay... I used d2l for 4 years so the transition for my last semester to a new platform was annoying. It's a nice system and I enjoy using it. Overall, I like the organization of Canvas and now that I am used to it, I like it much more than d2l. Very sleek and pretty and convenient. Better than d2l and probably more powerful than I know how to use. 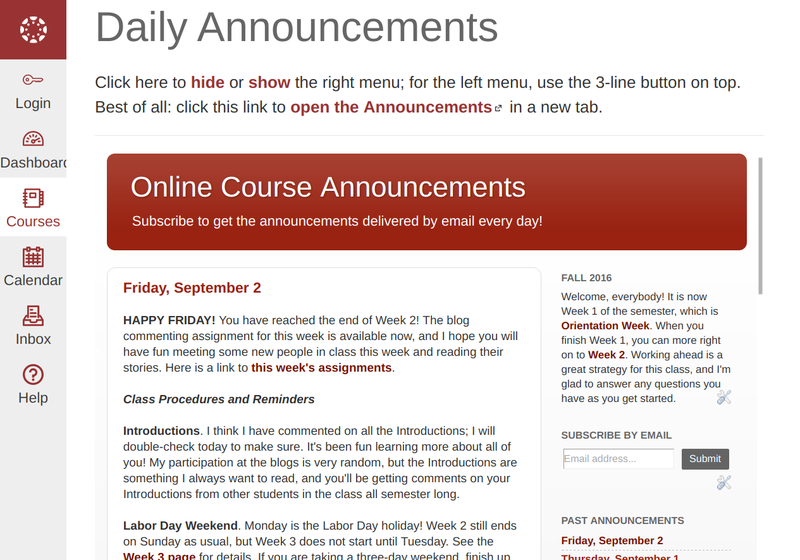 I like it, I just miss the text alerts from D2L. I like the modern take! Making Your First Game video. I loved this video about making a first game! It reminds me a lot of the kinds of advice I give my students especially as they brainstorm writing projects for my classes. So, I am bookmarking this for future reference: Making Your First Game. My long-term goal here is to offer a "text game" option side by side with the current Storybook and Portfolio options that my students choose from right now, and this video will be really helpful. Stage Two: The Game. Yes, a dream: no kidding! I dreamed about Kabir's poetry as a garden to wander in, and I realized that it could be a text game. So, I spent all of last Saturday making a game! Because I had the blog set up already, I decided to use the blog as a kind of storyboarding space, supplemented by a Google Drive Spreadsheet and a Google Drive Doc to keep track of my work. I created posts for each chunk of poetry, and then I looked for ways to connect them through shared lexical items. I did it in a very simple way: I started with one verse and then branched, and then branched, with a few triple branches and a few crossovers, but no real loopbacks. It's very simple: the idea is that you go into the garden, and eventually the path comes to an end and you are invited to start again. The shortest path has five turns (I'm pretty sure that is the shortest one), and the longest path actually has ten turns (I think! I got a little lost by the end, ha ha). 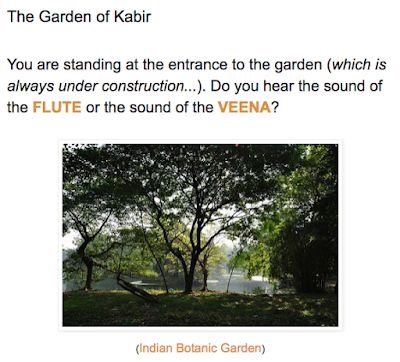 I'm calling it The Garden of Kabir. Stage Three. Party! I hope we can play this at the birthday party. I've played it on my computer, and it also works well using a browser on a mobile device because Blogger automatically defaults to a nice mobile view which is actually perfect for the game. I am really curious to learn what people think about this at the party, and I hope I will get some ideas for how to keep developing it. The way I think we can play it at the party is that I will read the first verse and ask someone to pick, then read again, ask someone to pick, and so on. It will be like walking through the garden together, sharing the decisions about which way to go next. There are going to be some really wonderful people at this party: artists, poets, people who do improv... so much good energy and wild imagination. So I hope to grab some new ideas there! 1. Learning resources at the blog. I want to develop the existing blog posts to have more links and background information so that people will better understand the poetry and Kabir's cultural context. For that reason, I will definitely be maintaining the blog and also expanding it. The blog post structure lets me add commentary, links, images, and video as needed, which I really like for making this a real learning opportunity. For literally 30 years I have wanted to immerse myself in a real study of Kabir... and now I am going to take a couple of years to do that. I am also thinking that the time may have come to finally (FINALLY) learn Hindi. 2. More Garden paths. I want to think more about how to create and maintain the paths in the blog version of the garden. I did it quite hurriedly and while all the paths seem to work, I am guessing they are not optimized. I am not even exactly sure how you optimize paths in a game. I am hoping to learn more about that as part of the Experience Play course! 3. I want to add more texts to the Garden. I relied mostly on Tagore because I could copy-and-paste from Gutenberg, but there are also some other great online resources I can use, including the verses of Kabir in the Sikh scripture Adi Granth, plus there is Ahmad Shah's public domain translation of the Bijak, along with some other freely available materials online. I also have some excerpts from printed books, like the wonderful book by Vinay Dharwadker, formerly of the University of Oklahoma; I met him my first year here, although he has since moved to Wisconsin. I am excited to get in touch with him when I have made some more progress here; we have not been in touch all these years, so this will be a very nice excuse to contact him and thank him for his beautiful Kabir book: Kabir: The Weaver's Songs. It is the book I would recommend to anyone who wants to learn more about Kabir and his legacy beyond what is available freely online. 4. Twine! I want to build something more like a maze using TwineThreads, something more structured than the rambling branching I have done at the blog. I will need to plan that out, and I'm not really ready to do that yet, but working in the blog space has given me so many ideas. What I am hoping is that I can build something really cool with Twine, and then figure out how to replicate it in a blog so that my students can choose either to learn how to use Twine and/or to build something in a blog space (since they already are doing a lot with blogging in my classes). Final thoughts on Digital Storytelling (in response to Keegan's prompt). I'm not really much of a technologist, so the digital is not what matters to me so much, except insofar as digital makes possible CONNECTED Storytelling, which is what I care about deeply. I love stories, all the stories... and I see all the stories as connected in a gigantic woven intertext. And yes, I also love that Kabir was, by profession, a weaver. The Internet (WWW) has given us a new way to experience the connectedness of stories, linking and sharing, sharing and linking. I am really glad that Keegan and Co. have prompted me to take my limitless enthusiasm and express it in a new form... a form that people can play. And in my next post I promise to say something about Sanskrit LILA, the play. Kabir has a lot to say about play too: plays of joy! And now... I need to go pack for my trip. Thanks again, Keegan, for this lovely opportunity. I never would have turned my widget into a playable game without your encouraging example!!! For a more up-to-date version of this post, see: Blissfully Blogging Announcements in Canvas at my Teaching with Canvas blog. I promised Michelle Pacansky-Brock some notes about my use of a Blogger blog as the landing page for my public Canvas courses at Myth.MythFolklore.net and India.MythFolklore.net. Click on those links and see: totally public, no log-in required! First, I'll explain why I use a blog this way, and then I'll review the nitty-gritty of how/why it works. Here are some of the reasons why I use a blog for the announcements: Daily Announcements Blog. 1. Blogs are essential to my classes. The students blog all their work, so modeling ways of using the blog platform is very important. I use blogs for almost all my class content development, not just the announcements. See, for example, my Writing support blog or my Freebookapalooza online library. 2. Blogs are open. This was essential when we had the completely closed D2L for our LMS. Now people can make their courses public, but having public announcements in a blog is a way to share a course even if people are shy to make their Canvas course public. Some former students continue to read the class announcements, and people who are not in my classes also subscribe. 3. Blogs have sidebars. Especially given my extremely limited ability to control my Canvas context (and it is sooooo boring), having that blog sidebar is a big plus, giving me a design space Canvas denies me. 4. Blogs can display Twitter and YouTube. My Twitter widget works great in the blog sidebar, and I really value Twitter as a way to share all kinds of content with students; I have a dedicated class Twitter stream at @OnlineMythIndia. I also like having a YouTube playlist in the sidebar (music!). 6. Students choose how to subscribe. 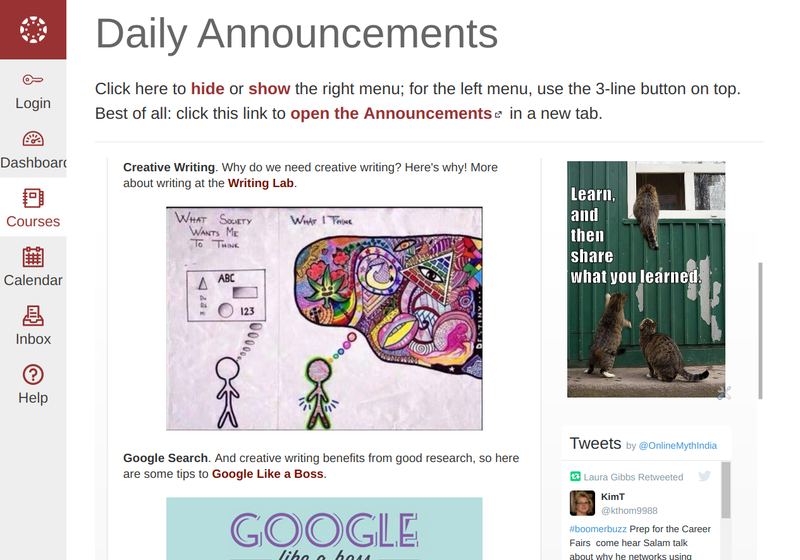 Students can subscribe to the blog by email if they want, or by RSS; they can even put the RSS feed for the class announcements in the sidebar of their own blog. 7. Blogs have labels. I use blog labels both for navigation and also to manage my workflow. It's easy to link to a week's worth of announcements with a rolling current label, for example: Current Week. Labeling the blogs by week (Week02) and by semester (Week02 F16) is a big help to me behind the scenes for content reuse (I can quickly compare my Thursday of Week 2 post to the same post last Spring or last Fall, etc.). 8. Mobile view. I often include links to the daily announcements in communication with students, and those links are mobile-responsive automatically; if they are checking their email on their phone, for example, they will see the mobile view when they click on the announcements link. I can also simulate the Blogger mobile view by adding ?m=1 to the blog address or to a specific post address; I like being able to quickly simulate the mobile view to see for myself how it looks. 9. One blog for two classes. This may just be peculiar to me, but because I am able to use the same announcements for both classes, having the blog is crucial. If I did the announcements using an LMS-based tool inside my courses, I would have to do them twice, and also edit twice (because I'm usually fixing typos during the day, etc.). Not good. 10. Don't put all your eggs in one basket. If/when the LMS is down, my announcements blog will probably still be up. 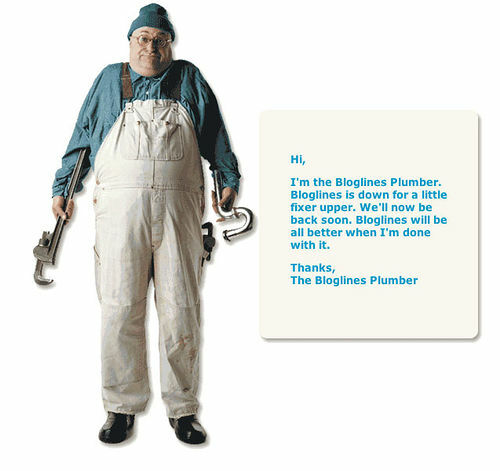 I've never had my blogs go down, but if they did, I could quickly put announcements in the LMS if I needed to. Having multiple channels of communication is always a good idea in my experience. But notice the difference: the course homepage has the right-hand sidebar, but the wiki front page does not. That difference will be important in the set-up described below. HTTPS. Blogger now has https. By default, it displays http, but you can use https too. That's what you need to display the blog in Canvas. The sidebar content also needs to be https to display in Canvas. Blogger templates. All the standard templates (NOT the "dynamic view" template) would work; I use the "Simple" template, and I set the blog width at 840 pixels and the sidebar width at 260 pixels. I put the page font at 15 pixels Arial with post titles at 18 pixels. I suppress the top navigation bar (the one with the search box). * Hide or show the right menu. * Reminder about how to suppress the left menu. * A link to open the Announcements in a new tab. There's no reason for them to stay in Canvas, so I feature this link to open the announcements blog in its own tab. Plus, if anything goes wrong with the iframe or some other accessibility problem, people can use this link to see the announcements where they really live: on the Internet. Custom URLs. When I created my custom URLs for my courses at my domain, Myth.MythFolklore.net and India.MythFolklore.net, I used the wiki page as the redirect address, so you don't see the right sidebar. Since I use those short URLs to share courses publicly with people who are not students in the courses, that makes sense: the right sidebar is basically useless for anyone who is not logged in. I think those are all my tricks, but if I forgot something, please ask! I really am a big fan of this approach; it is what I always did in D2L, and I am glad I found a way to make it work in Canvas too! * Sort by classes. Yes, I teach two "separate" classes, but my overall workflow is what I need to manage, and I need to see both classes at once. 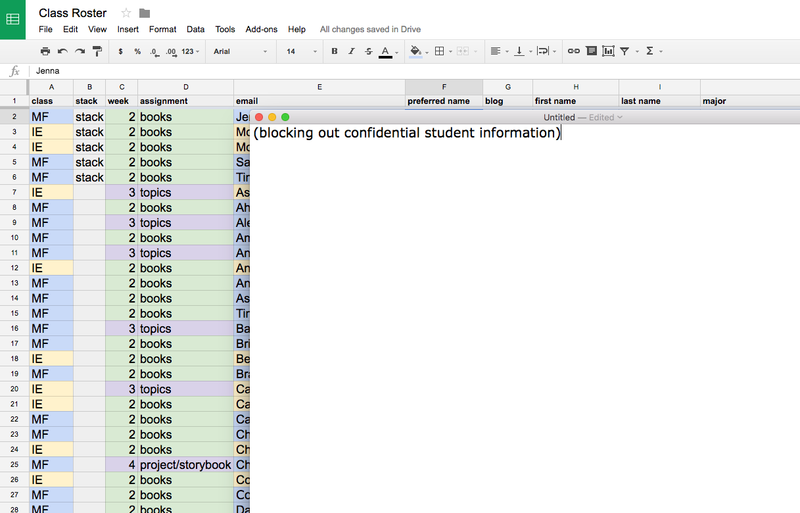 I do that in the spreadsheet; I can sort by Myth-Folklore or Indian Epics as needed, or mix them, and I color code those rows because, at least right now, I am still learning which student is in which class. Sometimes I want to organize my day based on both classes combined, sometimes I want to do one class at a time; the spreadsheet lets me sort either way. * Sort by assignment stages. I often send reminders to students based on what assignment they have due in the current week. The students are all on individualized schedules that diverge more and more as the weeks go by (based on type of project, revisions, etc.). So, I need to be able to sort both by week and by assignment. * Access email. See previous note. I send reminders based on conditions that Canvas cannot understand (it apparently can only message students based on a single assignment condition...?). This way I can sort and filter as needed on multiple conditions, and then grab the resulting email list, either for both classes together or separately. * Sort by "the stack. "There is where I can quickly see what project assignments are waiting for my comments; I can also quickly alphabetize that list to put in the public Google Doc where I let my students know that I have received their project, and it also alerts them when they should have gotten an email back from me with detailed comments. * See preferred name. Yes, Canvas lets students display their preferred name in some areas of the course... but not in the grading area. I want to be able to see preferred name, first name, and last name, and be able to sort on them as needed. * Blog address. I need immediate access to my students' blogs; this gives me a clickable link for each blog. * Color coding. Yes, it's just me, but I really rely on color coding, including conditional color coding that is so easy in a Google Sheet. Canvas marks late submissions red, but it doesn't let me control that or any of the other kinds of conditional displays I would like to see (like flagging students who are not currently passing the class, which is an important factor in whether or not I send email reminders). I just finished a great video convo with Michelle Pacansky-Brock, and I promised to follow up with some links to different course materials, sort of a "key" to how the courses work. This is something that might be useful to others too, so I'm listing the links here! I teach two courses, Mythology-Folklore and Indian Epics. The Myth class is usually around 50-60 students (technically it's two sections), and the India class is smaller, around 30-40 students (one section but overenrolled). In some ways the classes have a separate identity because the students mostly interact with the students in the same course they are enrolled in, but they also interact with the students in the other class too, especially towards the end of the semester when they are looking at each other's projects. For me, it really feels like one giant class because the courses are identical in every single way EXCEPT for the weekly reading. That is why you will not find a lot of separate links below; most of the course materials are used in both classes just the same. The key entry point for the students is the Class Announcements; once school starts, there will be class announcements every single day, including weekends. Here is how that looks: Week 5 of Spring 2016. As you can see, the announcements are about all kinds of stuff, not just due dates and reminders, although those go up at the top. The announcements and the class Twitter stream are both ways I try to convey to my students the fun and excitement of the topics we are studying in these classes. The way the students get started each semester is with the Orientation Week. It is designed to answer all their questions and to introduce them to the digital spaces/tools for the class. It is also meant to be fun! I am just now finishing up the revisions there to open up the classes on August 15 — official start of school is August 22, but students can get a head start if they want, and I'm grateful to have them test it out to make sure things are working before the rest of the class arrives for the official start. So, the best way to get a sense of how the class works is to look through those Orientation Week activities. By the end of the week, students will have a blog of their own, and it will already contain several posts. I start interacting with them beginning with the very first blog post. Later in the semester, the blog space really belongs to them and I don't comment there much, but during the first week of class, my #1 activity is watching the blogs come to life and leaving comments. Myth-Folklore UnTextbook: This blog contains the reading materials for the 100 different reading units that the students will be choosing from. The Indian Epics class does not have a single UnTextbook like that, although there is a main Indian Epics Reading Guide site, plus a separate site for the Public Domain Ramayana and Mahabharata and the image gallery that goes with them, and also our Library's collection of Amar Chitra Katha comic books (how cool is that??? we have the whole collection!). Some other important support sites for the classes are the Writing Laboratory, the Growth Mindset Cats, along with more motivational support at the Learn by H.E.A.R.T. site. I also created a Canvas demo course just for fun where I tried to see how many external tools I could make work inside Canvas; you can see that here: Canvas.MythFolklore.net. There's nothing I really want to do inside Canvas, but I thought it might be a good way to encourage faculty who do rely on the LMS to also work with Twitter, YouTube, Flickr, etc. Thanks for this post, Lisa! When I realized that I could not rename things inside the system, I knew this was not going to be an LMS that I would feel comfortable with. Students are already bored to death (just ask them!)... so I really disagree with a strategy that wants to make all classes look EXACTLY the same. The module page is the best example of that (like in your screenshot): every single Canvas course I have looked at is mind-numbing because there is nothing, literally nothing, you can do to a module page to make it your own. Just this week I started working on the module pages I build for my students, a different page for each week. I've redesigned the weekly module to add a randomized image, along with a new way of arranging the assignments to try to make it more streamlined and help students grasp the logic of the workflow in the class. I wrote up a blog post about that. My goal is something very simple (a value I share with Canvas)... but also CREATIVE (as opposed to the sameness that governs Canvas's basic design and deployment). The whole purpose of my class is to help students to see themselves as writers and to see writing, any kind of writing, as being a creative form of self-expression, with words being one of the tools they can use to "be themselves" in the world. Every semester, there are students who worry about taking the class because, they say, "I am not creative." Or "I hate to write." Or even "I hate to read." Yep. And that is the result of years of schooling in which people have to set aside their creativity, not being allowed to read or write things that matter to them. When they do that long enough, they start to doubt their own creative powers. No wonder they hate to write: why write if you think you have no creative powers? And why read if everything you are told to read is boring? But even if they have doubts about themselves as writers (at least at first), the students know that they are NOT the same as everybody else, and when they set up their blogs on the first day of class, they immediately start to customize the space: choose the colors, move things around, make their blog look "different" ... and they do that not for a grade or for points; they do it because they want the space to be their space, to reflect who they are. So, the first time I "see" the students in my online class, it is by visiting their very first blog post... and already I can see how they are building their own space online, a space that reflects their choices. Just the opposite of the total sameness that pervades Canvas. I can't imagine how it would be possible for the students to really get to know me or for me to get to know them in this monotonous space. But then, I don't expect to use the LMS for anything other than the Gradebook. And you already read about my trials and tribulations with the Canvas Gradebook yesterday! Today I will be spending probably about 7 hours manually changing the dates in the 210 declarations that make up one of my courses; thank goodness both courses have identical declarations so I only have to do this once and can then copy the course — and apparently Canvas does understand copying courses even though it seems to be clueless about copying quiz items. I used to have to do this with D2L also, years ago (although they finally came up with a mass edit feature that spared me this torture). Anyway, this is a familiar experience and I know what to do: the whole awful business is mindless enough that I can use my brain for something else while my fingers do the work, so I'll listen to an audiobook (I just started Abbie Farwell Brown's book of Norse myths retold; free at LibriVox! ), while I go click click click click to change all those dates for Fall. And on the subject of click click click, I cannot believe how Canvas makes students go through an extra "fear" click before they go to an outside link from the sidebar navigation. Here's the alert they get (and which I cannot suppress); they ALREADY clicked on a link that I myself chose to put in the sidebar navigation. Why on earth should they have to click again? Awful. And about those imgur links [commenting on Lisa's post, I used imgur links since I could not embed images in a comment]: as I learned from a Canvas training last week at my school where I was enrolled a student, students cannot upload an image to the system! I had to use imgur to get images to appear in discussion board posts. I doubt students are going to want to go through that extra step... but if you want students to put images in posts, they either have to hotlink (eeek, not a good web habit) or use a service like imgur. Sigh again. Of course, I made it a point to include images in every discussion board post I wrote for the training course, just to remind people that one of the joys of the web is being able to use images. 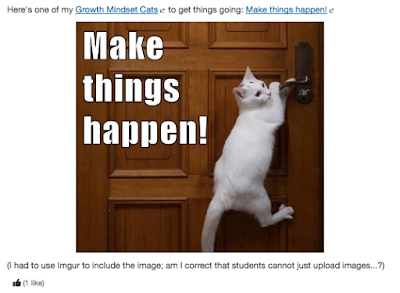 Screenshot from one of those posts: Growth Mindset Cat says "Make things happen." Eeek, I didn't even realize how long this comment had grown. I'll go post in my blog. Thanks again for giving me a chance to vent before I plunge into the date maelstrom this morning.